Last month my son and his family flew in from US to visit us. I took the opportunity to show my grand daughter her Joo Chiat heritage. I walked down memory lane once more. It was a sentimental journey to relive the past. 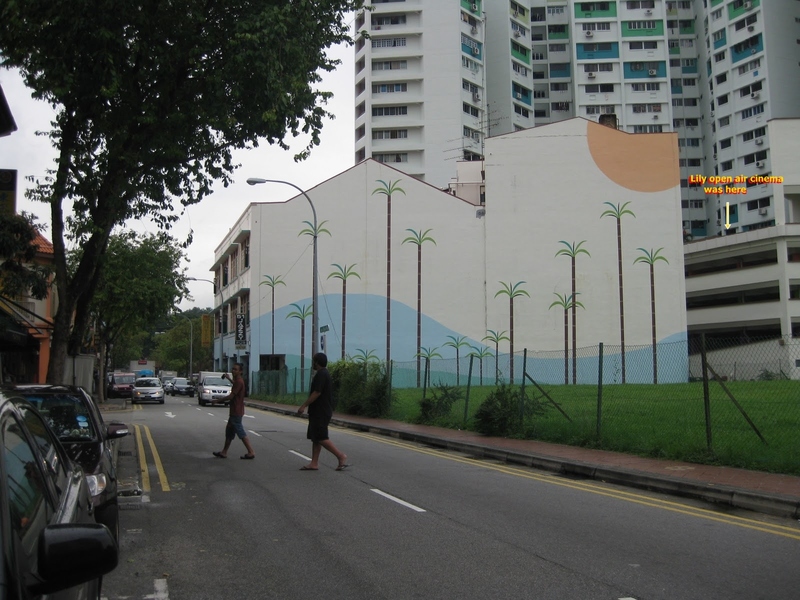 The vacant land between Joo Chiat Terrace and the Joo Chiat Complex evoke fond memories. On that piece of land once stood a block of 2 storey shophouses where I lived. 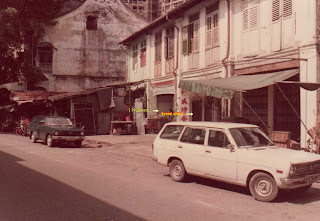 Chew Joo Chiat's house was in the block of 3 storey building. The two blocks of buildings were separated by a lane leading to Langsat Road. 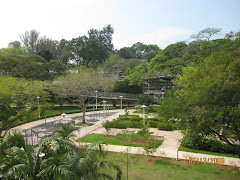 Behind my house was a small kampong where Chinese, Malays and Indians lived in harmoney. I had Malay playmates and learnt to speak Malay and played dum (Malay board game) with them. One of them, his father made very good chepak (leather slippers) for me. He also made songkoks and supplied them to the shops for sale in Geylang Serai. Another, his mother not only spoke Chinese dialect but also played si seks (4 coloured cards) and mahjongs with her Chinese neighbours. We grew up together. Yusof became a police detective and Ramlee a postman. 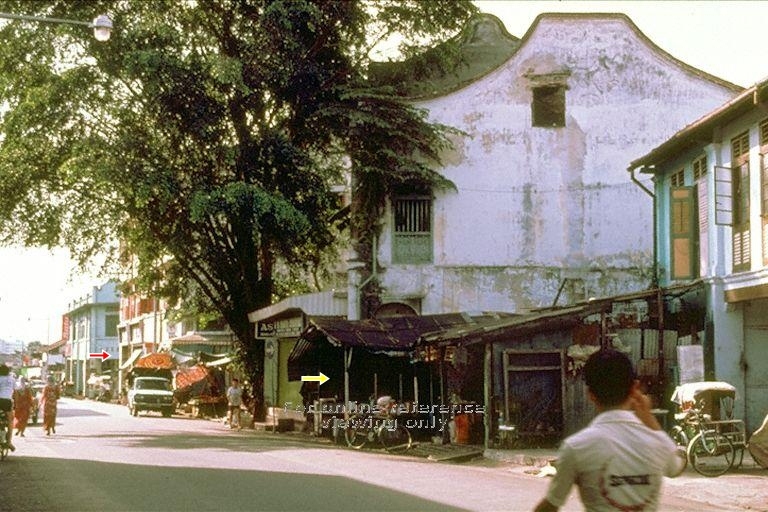 I lived in Joo Chiat Road from the day I was born till 1957. It was also my growning up years. The Pacific War ended with the return of the British. Singapore was then under the British Military Administration aka BMA. There was food rationing and black markets were thriving. Many people was out of job. There was a sudden mushroom of hawkers, especially cigarettes stalls. They were at street corners, roadsides and pavements. Joo Chiat Road from Joo Chiat Place towards Geylang Serai was a very busy place. There were 2 wet markets side by side. One was facing Joo Chiat Road and the other was facing Changi Road. Lining both sides of the road were shops selling a wide variety of consumer goods including Chinese medical shops, clinics, dentists, tinsmiths, photo studios etc etc. There was also an open air cinema known as Lily Cinema. It showed Chinese, Malay and Indian movies. It had wooden benches without back rests. An unwritten rule allowed movie goers to reserve seat by tying a handkerchief to the bench. During a popular movie show the benches were full of handkerchives. Late comers were frustrated at such a sight resulted in quarrels and fights. from the wooden clogs worn by housewives on their way to the markets. As the morning got brighter the noise increrased in intensity as more housewives charged to the markets. I got used to the noise disturbance and made it my alarm clock each morning to get ready for school and later for work. My house frontage had a recess from the road. Food hawkers set up stalls for breakfast. Housewives gathered to socialise and gossip. Some remained until the announcement of 'chap jee ki' result. I observed their faces. Very few smile but majority frown with disappointment. Nearby my house was a sidelane crowded with hawkers selling fresh fish from the kelongs, vegetables and fruits from our local farms and cooked food such as mee siam, bachor mee, prawn mee soup and others. Our family owned the land. Each hawker paid a fee including water supply. On week-ends and public holidays I was on duty. Occasionally I barter with the hawker for a plate of mee siam, or a bowl of mee. During the night a popular hawker stall selling satay and porridge aka choke in Cantonese occupied the frontage of my house. Every night after the open air cinema show ended, streams of movie goers walked pass my house. Many stopped by to have supper. Due to its popularity the hawker stall had become an icon in Joo Chiat Road. My next door neighbour was a tyre shop. The owner had a Ford car and every morning drove his car to his other shop in town. In the morning on my way to school I had the opportunity to watch him starting his car. Today we started the car engine by the turn of a key. It was very laborious then. First the driver took a crank rod from the car. The metal rod had a 'z' shape with one end longer than the other. Next he walked to the front and pushed the longer end through a hole under the radiator to connect it to the main shaft. He used the shorter end as a handle to crank start the car engine in clockwise motion. He could never start the car engine with one go. Strength was needed to crank up the car engine and doing it continuously a few times could be very tiring. Once the car engine started, he pulled back the metal rod and put it back to the side the car. Finally he drove the car away. It was a daily ritual for him. Photo from PICAS Background on the left, a red arrow shows a lane leading to the open air Lily Cineman. A white arrow in the centre shows the side lane that led to Langsat Road. Are you referring the book shop "Chop Chuan Seng" opposite Joo Chiat Terrace? You are right! There was a bookshop opposite the ticket counter. At the side of the book shop was a narrow lane that led to the side entrance of Joo Chiat market. Thanks for the memory. The food stalls at Joo Chiat Market were resited to Blk 630 & 216 Bedok HDB Estate. Some went to Haig Road Food Centre. Because of this blog, my wife and I went back to Joo Chiat to eat, all within a day. For lunch at Guan Ho Soon peranakan and dinner were the bowls of won-ton mee from Fei Fei. Join me for lunch soon? A Peranakan restaurant should specialise on Peranakan food alone and not cater non Perankan food in the same premises. Try the Peranakan restaurant at Frankel Ave and you will be able to tell the difference. Fei Fei wanton mee had not been the same since the original hawker had left the shop and taken over by his sons. But many people still patronise the mee stall then. Perhaps they had not eaten the original wanton mee prepared by the old man. I have not been there for years and do not know who is operating the wanton mee stall now.